Kalamazoo, MI February 19, 2016 – The Kalamazoo Symphony Orchestra is excited to announce its 2016-17 season. From the programming to the artistry, each performance, composition, and note promises to be better than the last as the KSO “Makes Waves” in Kalamazoo this season! In this ninety-sixth season, the KSO’s Symphonic Series boasts a superior lineup of virtuosic guest artists, including internationally-renowned pianist Yefim Bronfman, as he returns to Kalamazoo after his memorable Gilmore Keyboard Festival performance and Stilian Kerov, who will lead the orchestra and guest violinist Liza Ferschtman in a program featuring Barber & Bartók. 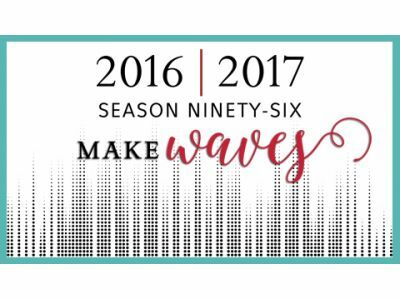 Special appearances by harpist, Emmanuel Ceysson, and legendary organist, Cameron Carpenter, will add variety and “make waves” in our traditional symphonic programming. Music Director Raymond Harvey has chosen to perform Mahler’s Sixth Symphony and will close the season with the ever-popular opera,Don Giovanni, which has not been performed by the Kalamazoo Symphony in 36 years. The KSO has combined its Pops! and Special Event programming this season to offer more subscription benefits to symphony subscribers. The KSO’s new 2016-17 Special Events Series! will celebrate the accomplishments of some of music’s greats including Ray Charles protégé, Ellis Hall, in a Ray Charles & Motown tribute, as well as a special evening dedicated to one of Broadway’s legendary artists – Marvin Hamlisch. The KSO is proud to continue their longstanding holiday tradition with another world renowned vocalist this Christmas - opera star, Angel Blue. This season includes three concerts geared toward family. The KSO Family Discovery Series is proud to announce the production of a KSO original, The Night Before Christmas, as well as Mozart’s Magnificent Voyage, which will be produced in partnership with Classical Kids LIVE!, with whom they successfully partnered for the 2015-16 Family Discovery Series. Year two of their exclusive Disney partnership features a family favorite, Disney and Pixar’s Ratatouille in Concert! Under the baton of Maestro Raymond Harvey, the Kalamazoo Symphony Orchestra will play Michael Giacchino’s score while the full length movie plays on the big screen. Ticket prices for all family programming have been reduced this season and can be found on the Kalamazoo Symphony’s website. Catering to a smaller more intimate audience are the KSO’s Classics Uncorked, Classics On Tap and The World Of series. These series feature smaller orchestral ensembles and a more casual atmosphere. Classics Uncorked and On Tap feature select KSO Artists In Residence and deliver a more casual and social musical event. The World Of series is one of Maestro Harvey’s favorites as he takes to narrating and exploring the lives and influences of some of history’s most significant composers. This year the focus is on Gioachino Rossini and Bedrich Smetana. Current subscribers will receive their personalized renewal packets in the mail or can renew their subscriptions now by calling the Kalamazoo Symphony Orchestra office at(269) 349-7759. Subscriptions for first time subscribers are available for up to 30% off and can be purchased through the KSO office or online. Single tickets will go on sale August 22, 2016. Please visit the brand new kalamazoosymphony.com for more information. You won’t need your passport for this around the world adventure, just a ticket! Every season Maestro Raymond Harvey explores the lives, influences and inspirations surrounding two of history’s most influential composers. Join us this season as we take an exciting adventure through “The World of" Italian composer Gioachino Rossini and Czech composer Bedrich Smetana. Tickets available as subscription add on for $10 per ticket. The Kalamazoo Symphony Orchestra receives major support from the Irving S. Gilmore Foundation, the Kalamazoo Community Foundation, the National Endowment for the Arts, and the Michigan Council for Arts and Cultural Affairs. The Kalamazoo Symphony Orchestra also receives generous support from other local, state and national foundations, as well as private and corporate support. For more information, visitwww.kalamazoosymphony.com.